Eee PC 1008 - watch out, MacBook Air! Taiwanese manufacturer Asus has been showing off its latest superslim Eee PC 'seashell' netbook and a bunch of uber-powerful Lamborghini laptops at London's Design Museum, this week. What Laptop magazine's team was in attendance to get their hands dirty with the Eee PC Seashell as well as the new Eee PC T91 and Eee PC 1000 HE netbooks. 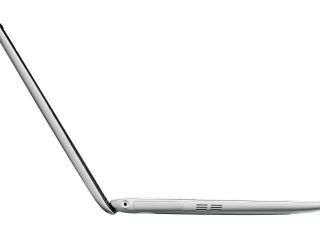 Impressively, the mag is already claiming that the Eee PC Seashell "looks set to become the most desirable netbook yet, with a slimline finish that makes an Apple MacBook Air look bloated." Specs and internal components are the usual Intel Atom processor, 1024MB of memory, 1,024 x 600 pixel screen and Windows XP on the first available models, but it is in "the design where the Eee PC Seashell really stands out, with an incredibly attractive clamshell finish that puts its rivals to shame." If that wasn't tempting enough: "in order to further differentiate the 1008HE from other netbooks, Asus is adding a host of proprietary software as standard, looking to provide enhanced usability that will appeal to all types of user." Importantly, the keyboard on the Eee PC 1008 is solid, durable and one of the best netbook keyboards TechRadar has yet hammered away at with our big fat gentlemanly fingers. Pricing and release dates to be confirmed shortly. Asus has also been showing off the gaming W90 laptop, the M90 high-end multimedia laptop, the VX5 Lamborghini and its new ultraportable, the U-series. Multimedia functionality, not gaming, is the focus of the M90, with a "whopping 18.4-inch LCD screen… a chassis covered in a mock-wood finish," and "a large wheel and a number of touch activated buttons" next to the keyboard, "designed to make editing and browsing quick and easy." Internally you are looking at a high-end Intel Core 2 Duo chip and a suitably high end graphics chip. Asus' Lamborghini VX5 is described as "a menacing looking machine with angular lines and sharp edges carved out of genuine leather and brushed aluminium." It is a machine that "oozes style and sophistication, when you boot up the laptop a Lamborghini engine screams at you, and we can't wait to get our hands on it later in the year." Funnily enough, neither can we! Finally, Asus' ultraportable U-series laptop is powered by an Intel Core 2 Duo processor, "which should provide plenty of muscle for multitasking, and can take a 500GB hard drive. The LED backlit display is powered by a Nvidia GeForce G 150 M."
For the show-offs out there, the Asus U "even features an illuminated touchpad which lights up as your finger traces across it, should have trouble locating your finger in the dark." Expect the Asus U-series to arrive later in 2009. As ever, we'll bring you more news on finalised specs, pricing and release date as and when we get it.